Install latest Krita in Linux - Hello everyone, I have good news for you. Today the Krita team releases Krita 3.1.1, one of best free drawing software, digital painting and sketching with many new features, performance improvement and bug fixes. 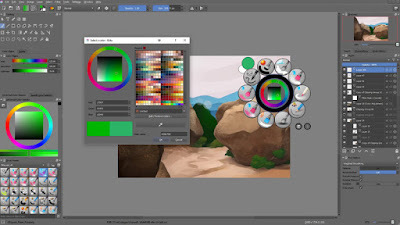 Krita is an open source and professional free painting application for Linux, Mac OSX and Windows. It is made by artists that want to see affordable art tools for everyone. What's New in Krita 3.1? Halftone filter added. Find it in the main menu: Filters > Artistic. Auto-saving while working is more stable. Fixed race condition while saving. Visit its official release notes for complete changelog. Finally Krita Lime PPA has changed the official binaries from Krita3-testing to stable builds. Please note, older versions of Ubuntu ( including 16.04 Xenial Xerus LTS ) are not supported by this repository due to outdated version of Qt library provided. As we mentioned earlier, older version Ubuntu are not supported the latest version of Krita. But you can use AppImage builds instead. Simply head to its official site to get Krita Desktop App Images. That's it!